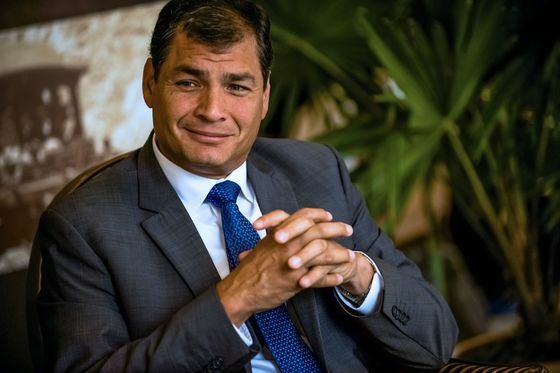 (Bloomberg) -- Ecuador’s former President Rafael Correa, who faces arrest if he returns to the country, is seeking to start his comeback in elections this weekend. A poor showing for President Lenin Moreno, a former Correa ally who split with him after winning the presidency in 2017, could complicate the governments efforts to adhere to fiscal targets mandated by a $10.2 billion, IMF-led financial program. Correa has campaigned on social media from his base in Belgium to win control of the Citizens’ Participation and Social Control Council. The self-described socialist says that control of this body, which picks top judicial and regulatory officials, would allow him to roll back Moreno’s austerity policies. A local referendum targeting INV Metal’s Loma Larga gold project could meanwhile set a negative precedent for the country’s fledgling mining industry. Moreno’s government secured a $4.2 billion loan package from the IMF last month, and more than $6 billion from other international lenders. “Correismo will win some triumphs,” including seats on city councils of major cities like Quito, said historian Gonzalo Ortiz. Though Correa left the economy in shambles, voters are now blaming Moreno, for many of the country’s problems, Ortiz added. Balloting for roughly 6,000 posts, including the first-ever vote for members of the Citizens’ Participation and Social Control Council, will run from 7 a.m. local time to 5 p.m.